This is an egg free, lactose free, gluten free and vegan cream, perfect for those that have food intolerances. I often make this cream for myself as I am not big on the cream made from dairy. This is also a good base for healthy ice creams as well as frosting for cakes. 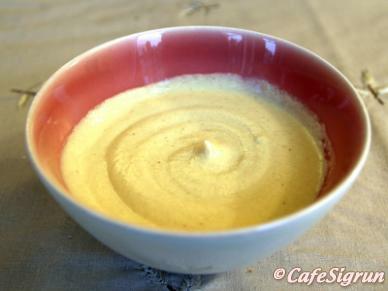 Note that you will need a food processor to make this cream. Note also that you will need to soak the dates and the cashew nuts for 2 hours before blending. Chop the 2 dates very finely. Place the 180 grams cashew nuts and the dates in a medium bowl and cover with water. Soak for at least 2 hours. Drain the dates and cashew nuts very well and place in a food processor. Add the 125 millilitres orange juice and 1 teaspoon vanilla extract. Blend for 3-4 minutes or until completely smooth and creamy. You may need to scrape the sides of the bowl every one minute or so and continue blending. Transfer to a bowl and cover with cling film. Keeps for several days, or you can place in the freezer for a few months. You can use macadamia nuts or Brazil nuts instead of the cashew nuts.